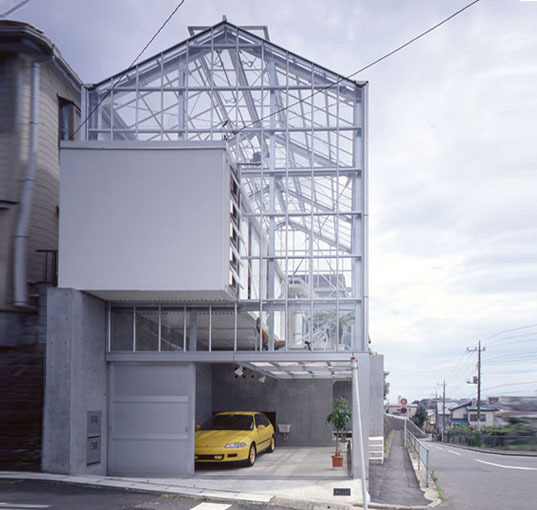 Seen on JA+U (Japan Architecture+Urbanism), the F3 House in Tokyo was designed for an owner who had only two requests: a spacious garage for his cars, and an area where he could indulge in his passion for cooking. Architect Koh Kitayama packed all the necessary functions into the smallest possible area, leaving the rest of the house to provide space for the owner’s favorite pastimes. Located in a hilly suburb of Tokyo, the daylight-filled house is liberated from the conventions of contemporary residential housing. The F3 House resembles a three-story industrial greenhouse. The glazed outer shell of the house is supported by a steel framing system and finished with glass panels used for greenhouses. Except for a long container-like element inserted into the main structure of the building, its entire envelope is completely transparent. At street level there is a large garage and a compact toilet hidden behind the concrete wall at the rear of the house. The mezzanine above the garage is a grille that serves as the relaxation area, while the top floor is a large deck with garden furniture and a parasol. The container comprises a kitchen and a bathroom. The wall that separates it from the rest of the interior can be sealed with special insulated shoji sliding paper screens. The top story houses another outer room, with the ridge of the glass roof hinging upward to ventilate warm air. 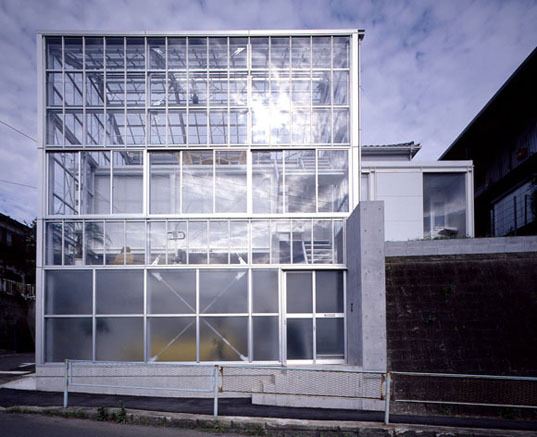 Photo © Shinkenchiku-sha Co., Ltd The F3 House resembles a three-story industrial greenhouse. Photo © Shinkenchiku-sha Co., Ltd The top floor is a large deck with garden furniture and parasol. Photo © Shinkenchiku-sha Co., Ltd The mezzanine above the garage is a grille that serves as the relaxation area. Photo © Shinkenchiku-sha Co., Ltd The container comprises a kitchen and a bathroom. The wall that separates it from the rest of the interior can be sealed with special insulated shoji - sliding paper screens. Photo © Shinkenchiku-sha Co., Ltd The top storey houses another outer room, with the ridge of the glass roof hinging upward to ventilate warm air. Photo © Shinkenchiku-sha Co., Ltd Except for a long container-like element inserted into the main structure of the building, its entire envelope is completely transparent. Photo © Shinkenchiku-sha Co., Ltd Located on a street corner, all lit up from the inside at night, the house reveals almost all aspects of the owner’s life. Photo © Shinkenchiku-sha Co., Ltd The owner says:"People don’t look inside on purpose. It’s so open that passers-by are too embarrassed to peer in".